Why Why Swimming Is Great For Effective Weight Loss! Today’s guest blogger is Karen Fernandes! She is focusing today on the benefits of swimming for weight loss. Why Swimming Is So Great For Effective Weight Loss! Before you start, you’ll need to take a trip to the shops and get kitted out. You’ll need a swimming bag to keep all of your clothes in, along with a swimsuit (or two, for when ones wet), a towel, a tracksuit to put on when you’re done and some swimming goggles. Some people use a swimming hat too; this is up to you. If you are taking part in a swimming class for example aqua-aerobics then the equipment such as floats will generally be supplied, but it’s always worth checking to make sure. The next step is to find a local swimming pool that offers lane swimming as opposed to general swimming; you will need to be able to swim up and down unobstructed. Some people go along with a friend, while others prefer to go alone; it’s up to you. You won’t be able to chat when you are swimming together but you will be able to share lifts and swap weight loss tips on the way there and back. The first time you visit the pool you will be shown around and told where the changing rooms, showers and toilets are. Then it’s just a matter of taking the plunge! 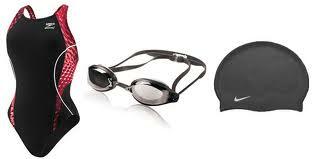 The important thing to remember when you are swimming is to make sure your strokes are right. The more disciplined you are with your strokes, the more results you will see. Some people tend to get a few refresher lessons to get started as they may not have had any since they were at school. Most pools have a big timer clock on the wall, so set yourself a target, for example 50 lengths, and time how long it takes you. The next time you go swimming, do the same thing again and try to get your time down. 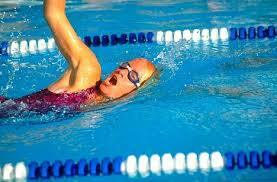 The faster you swim, the more your body works, and therefore the more weight you will lose. The beauty of swimming is that it costs very little. All you need is a few basic things to get started. You will also have to pay for entry to the swimming pool, so it may be worth finding out whether you could save money with a season ticket instead. Some people get into it so much that they even build their very own swimming pool in their house or garden! The author of this post is Karen Fernandes, a freelance blogger who enjoys sharing her ideas and experiences online. She often writes for Austin Pro Leak, specialists in pool plastering. She enjoys listening to jazz music and blogging about fitness tips in her free time. You can follow her on Twitter for more information. « EXERCISE SMART for a lean and balanced body!